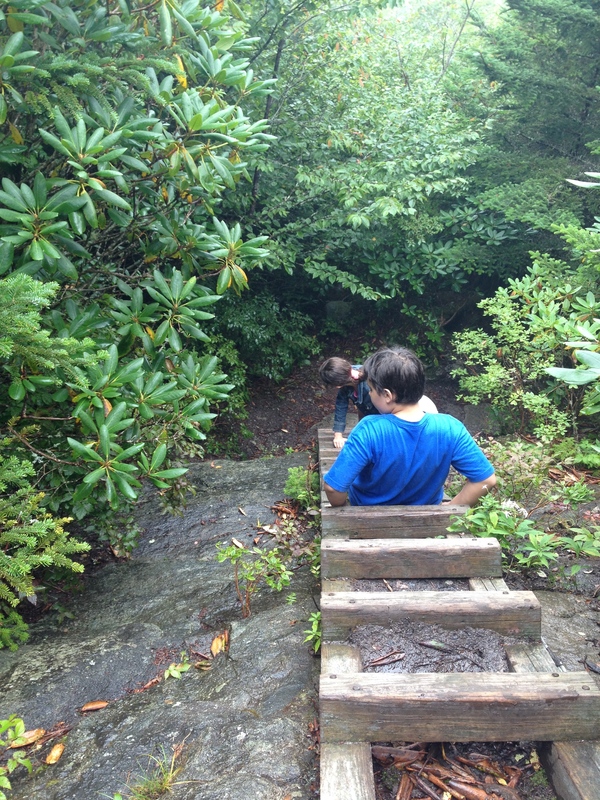 You can reach the summit of Grandfather Mountain, at Calloway Peak, by way of three different trails. My goal is to hike all three over the next couple of months. Today, I took the kids up the Daniel Boone Scout Trail–about a six mile in-and-back hike, with nearly a half-mile gain in elevation. All three kids (and Finn the Crag Dog) had a great time, though it was certainly a long day of hiking. The weather said we would have intermittent showers. What that meant for us, at our altitude, was a fairly continuous drizzle and mist for most of the first two miles. No one complained, though–and in fact, the rain seemed to add to the sense of adventure and exploration for the kids. We stopped several times along the way–sometimes for water or a snack, sometimes to check out a view (though in all honesty, the only views we had today were of a thick fog). And toward the summit, we stopped to pay our respects at the wreckage site where a plane came down in the late 1970s. It took us about two and a half hours to reach the summit. We stood out on the bare rock for five or ten minutes, keeping a close eye on our dog, who seems to have little fear of cliffs. Then back we hiked back. I suppose there is something profoundly pointless about climbing a mountain. And I can’t really think of a more compelling reason for why anyone would want to climb a mountain. This entry was posted in Uncategorized and tagged family, intention, nature, simplicity. Bookmark the permalink.